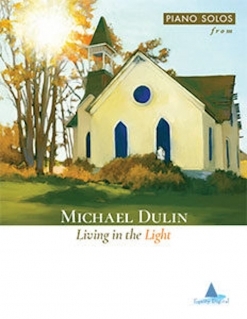 Living in the Light is the companion solo piano songbook to Michael Dulin’s 2018 recording by the same name. 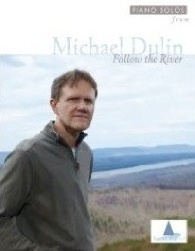 Both contain fourteen classic hymns arranged and transcribed by Dulin, who is an extremely accomplished pianist and composer. I need to say upfront that this songbook is not for beginners or intermediate pianists. Pianists with small hands will also run into difficulties as there are many reaches of a tenth or more throughout the music. Of course, there are work-arounds like rolling the chords or shortening them, but playing the pieces exactly as written will be a problem if you don’t have a wide reach. Those are the negatives. The arrangements are full and often have variations that are quite “showy” and complex. Several of the pieces have sections of the melody played with the left hand, which is a very pleasant and interesting contrast to how they are usually played. These arrangements would be best performed during offertory, as solo piano anthems or interludes, or at the beginning and end of services. 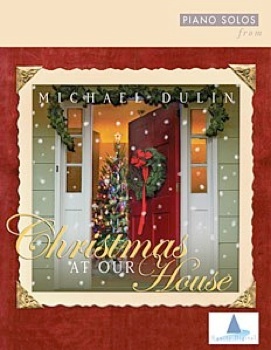 The book itself is spiral-bound with full-color artwork from the CD on the front and back covers. The notation is roomy and clear with expression and metronome settings included. 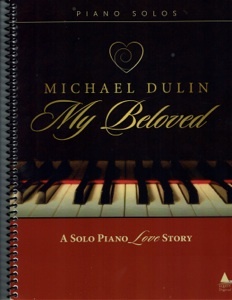 The books are available from www.MichaelDulin.com and Amazon. Recommended for advanced pianists with big hands!